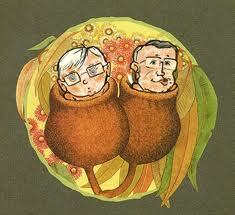 ← ASHBY V SLIPPER APPEAL: the first round. FROM SNUGGLEPOT and CUDDLEPIE to NUTCOTE. A tribute to May Gibbs. I have often wondered why it is that local residents don’t do the touristy thing in the city they call home. When I’m in foreign cities I take great delight in visiting the homes of well-known artists and other historically important persons. My favourites are Charles Dickens house in London, Rodin’s amazing house in Paris and the home of Henry Frick in New York – all now museums. But this sense of adventure and discovering the homes of locally produced artists and persons of note seems to evaporate as soon as one arrives back to Kingsford Smith. 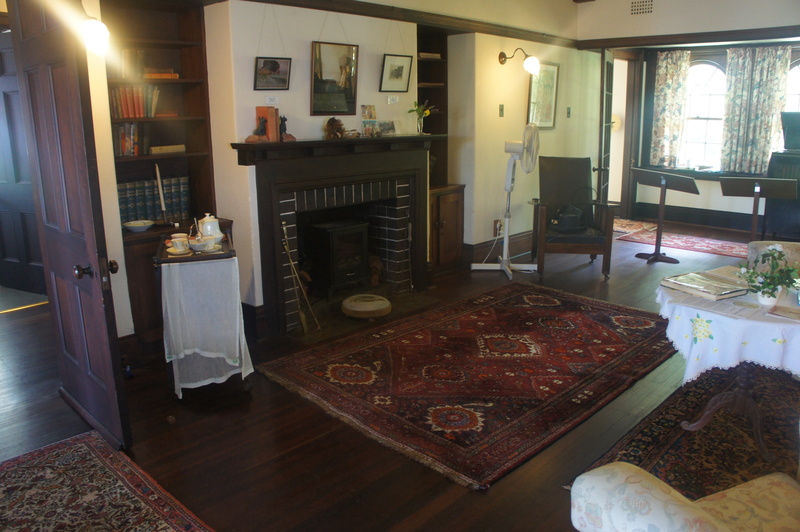 May Gibbs’s house, Nutcote, in Neutral Bay where she lived for 44 years. 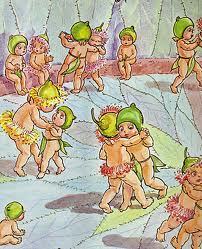 Like the vast majority of Australians over 45 years, my sister and I grew up on the Adventures of Snugglepot and Cuddlepie, the gumnut babies, written by May Gibbs. These much loved tales were then read to our children from what is now a tatty and very old compilation of these fairy stories. I continued to read the daily comic strip of ‘Bib and Bub’ well into adulthood, never failing to be delighted by the strength of the narrative and the skill of the artist. 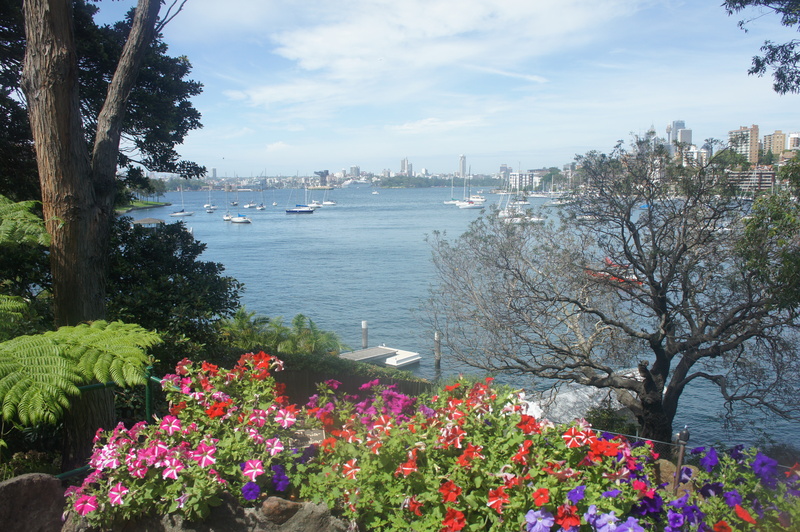 Yet, I am ashamed to say, I have never visited Nutcote, May Gibbs’s Neutral Bay home for forty-four years until her death in 1969; that is until recently. 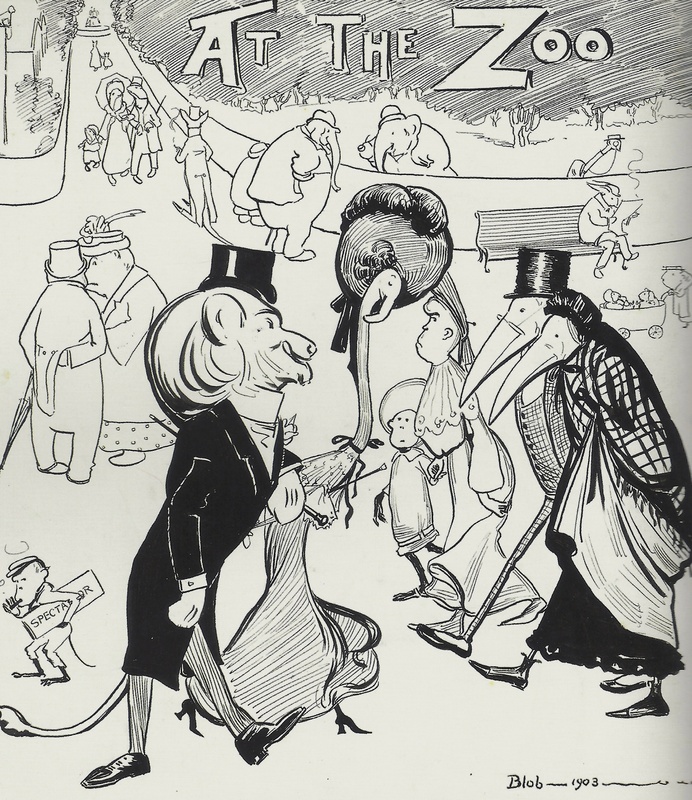 For the latter part of the Victorian era until well into the 20th century children’s stories with artwork in the Art Nouveau style, quintessentially English fairies, pixies, elves and the like were created by a host of English children’s novelists and readily available in the Australian book market. 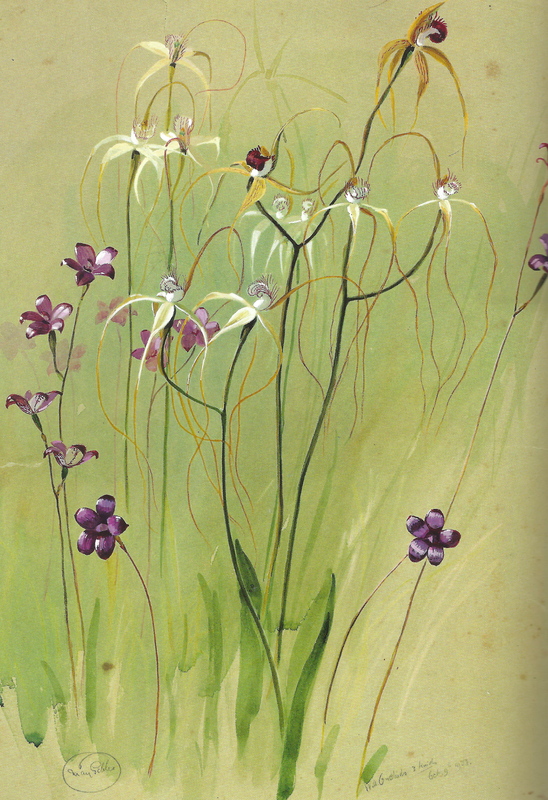 This was made easy as Australia was part of the English publishing geographical foot print, a legacy of the Imperial reign as I think we still may be, but May Gibbs was among the pioneers who created children’s fairy stories using identifiable Australian flora and fauna. 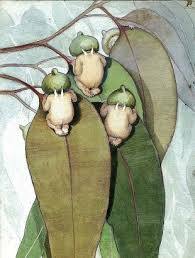 Her first tale was “the Gumnut Babies’ published by Angus and Robertson in 1916. I think the first published Australian children’s book was written by Ethel Pedley in 1899 who created ‘Dot and the Kangaroo’, which I always found to be as boring as batshit. Norman Lindsay wrote his wonderful ‘The Magic Pudding’, which wasn’t published until 1918, and is really intended for an older audience. ‘The Adventures of Snugglepot and Cuddlepie’ were fabulous stories so beautifully rich in heroes and very scary villains. 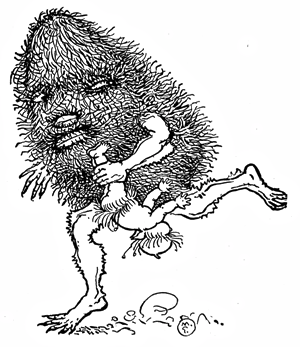 Who didn’t have nightmares involving the wicked Banksia men? Like most fairy stories Gibbs writes morality tales with lessons to be learnt for, and hopefully remembered by, young children, but there is also substance to her characters and a complexity in her stories. This is why they endure and why adults take as much pleasure from reading them as do children. 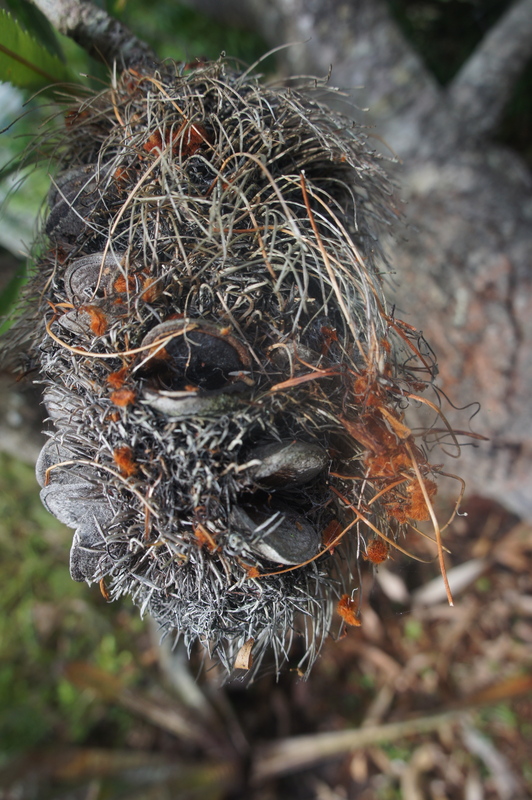 His Nibs, when we were planting a garden at our Jervis Bay beach hut, wanted a banksia tree. I didn’t. He won. To this day I cannot look at our banksia tree without thinking of the wicked banksia men who kidnap naughty Gumnut and Gumblossum babies. What a brilliant use of a bush flower as a character in a fairy story. Might I add when we get bush fires at JB you should see the banksia trees. They go up like a packet of crackers, which was the main reason why I didn’t want to plant one near our house in the first place. We pick the dried banksia cones as they are the best fire starters for our open fireplace. There’s a wonderful book on May Gibbs entitled ‘More than a Fairy Tale – an Artistic Life’, written by Robert Holden and Jane Brummitt, and published by Hardie Grant (2011). It could be easily dismissed as a coffee table book because of the most extraordinarily beautiful reproduction of so many of May Gibb’s illustrations but that would be a serious error. This book concentrates on May Gibb’s early life and the influences that would play a part in her creation of the Gumnut baby adventures. From the backwater that was Perth in the latter part of the 19th century, a precocious talent was given ‘a voice’. Early examples of her talent and skill as a prepubescent teenage artist are shown here, some for the first time publicly, others have not been published for nearly a century. 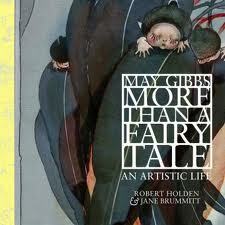 Just for the range and variety of May Gibbs’s work alone this book is a must. You should see her Christmas card to a friend, which she drew when she was only 9 years old. 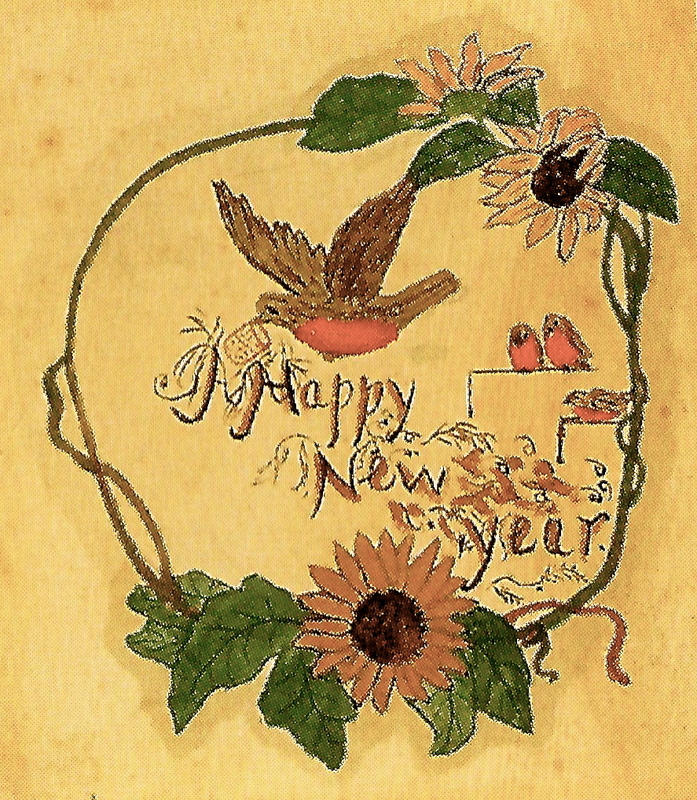 May Gibbs was first published in the Christmas Edition of the WA Bulletin in 1889 when she was twelve years old. There are a series of socially satirical cartoons published in Perth’s ‘Spectator’ from 1903, which I especially love. ‘More Than A Fairy Tale’ takes you on her journey until the publication of the stories that we have come to know and love. 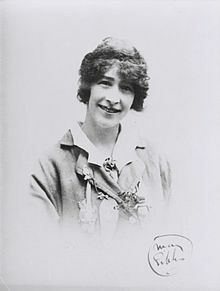 It deals with her return to England to attend various art schools and colleges to perfect her technique, her connections and friendships with members of and involvement with the suffragette movement. In addition there are examples of her work used as part of the war effort. Attempts to create for herself a career meant having to escape the claustrophobia from an overly protective family so typical of late Victorian and Edwardian times, which she did by moving to Sydney. All are dealt with in an illuminating story resulting in examining the essential elements required in the artist’s struggle to find an environment in which an artist can work freely. The problem for the two historians who wrote this book is that Gibbs didn’t keep a diary, nor did she seem a regular letter-writer; or if she was, most of her correspondence has been destroyed. What she did do to chronicle her experiences was draw. Her diaries are the sketches, water-colours, pastels, cartoons she left behind. There is the occasional assumption drawn by the authors. The major example with which I have an issue is the chapter on the Paris Exhibition. There’s no evidence she attended the Paris Exhibition of 1900 even though some examples of her work were on display in the WA Court and were very well received. There are no sketches of the Paris Exhibition at all. Yet the authors, understandably, can’t believe she wouldn’t have gone so they make the assumption that she did. I know I’m being picky, but the story is then why isn’t there evidence either one way or the other. Gumnuts – a rear view. However, despite this lapse they conclude with a brief comparison of the lives of Gibbs and English children’s author, Beatrix Potter. One I found fascinating and for which I’m grateful as I wasn’t aware of the similarities in their lives. The lives of May Gibbs and Beatrix Potter seem to be totally in sync being lived out at the opposite ends of the planet. Both were precocious talents. Both had progressive political ideas involving conservation and the rights of women. Both were suffocated by the protective constraints of their immediate family (although Gibbs was always given support by her parents when it came to pursuing her artistic dreams unlike Potter). Both women left home to escape parental control. Both were married very, very late in life. Both women became the leading children’s novelists of their time in their respective countries. Both women have, long after their deaths, continued to be beloved by all. Against all odds, they became uncompromising, successful women of independent means whose fairy tales still resonate with the very young and delight the rest of us. 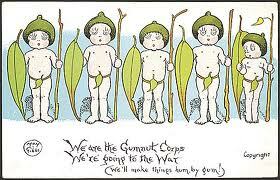 Do yourself a favour and visit Nutcote where so much of May Gibbs’s work is on display. The house is on the harbour with absolutely stunning views that can be enjoyed as you have a Devonshire tea. A lot of her work is here and there are two fascinating little videos, one being her last recorded interview. The house is an interesting mixture of style. It’s a three-bedroom cottage. The exterior is a Californian bungalow style with Mediterranean finishes. The inside is a good example of the English Arts and Crafts Movement. (A lot of her drawings reflect that in their style in my view). There’s an elegant simplicity in each of the rooms allowing in light as well as the views of either the Harbour or her much loved English garden. As with any Arts and Crafts house the use of wood in all things dominates the space and is gorgeous. Jarrah wood for all the floors had to be shipped in from the West Australia and, despite their age, look as fresh as a daisy. Beams, skirting boards, picture rails and fireplaces, built in cupboards, all made from cedar. 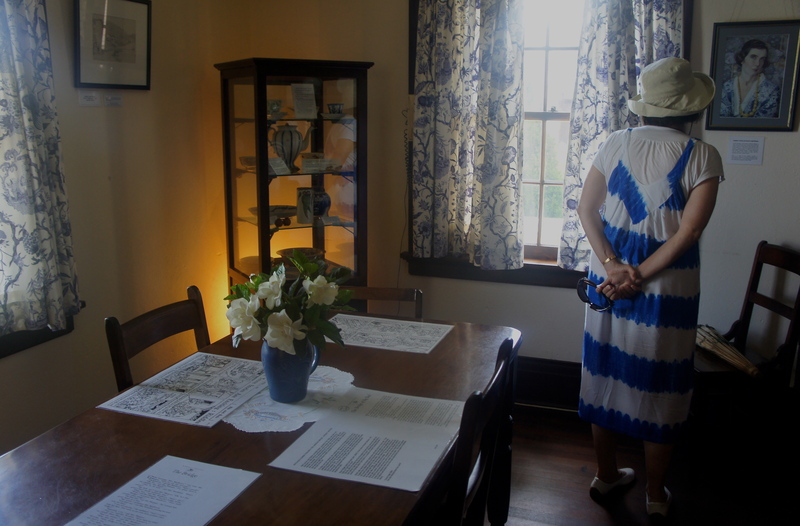 A lot of the furniture on display belonged to Gibbs. 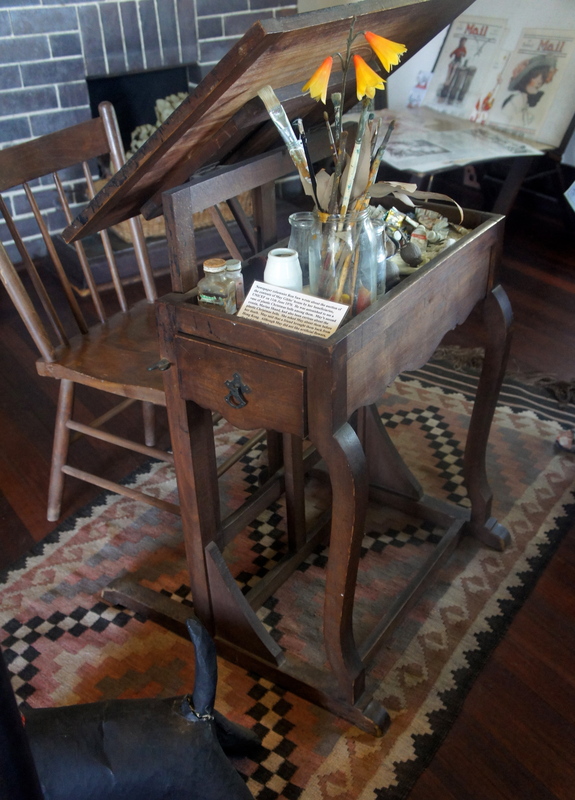 Of particular interest is her work desk, and the room she chose as her studio. There is a kitchen with a Kooka stove and a sink and not much else. How they cooked huge meals in those days is a total mystery to me and the other tourists who were visiting. It became a lengthy discussion about what can be achieved in no or little space without kitchen appliances to help. My view is that men didn’t cook in those days so the kitchen was deemed unimportant. But I do remember my grandmothers’ kitchens and they were similarly tiny and inadequate. If you are ever in Chicago go to the University of Chicago and visit the Frank Lloyd-Wright house on campus. As brilliant a designer as he was, his kitchens are hopeless. If he had been a hobbyist cook he would have got stuck in to designing brilliant kitchens and kitchen appliances. 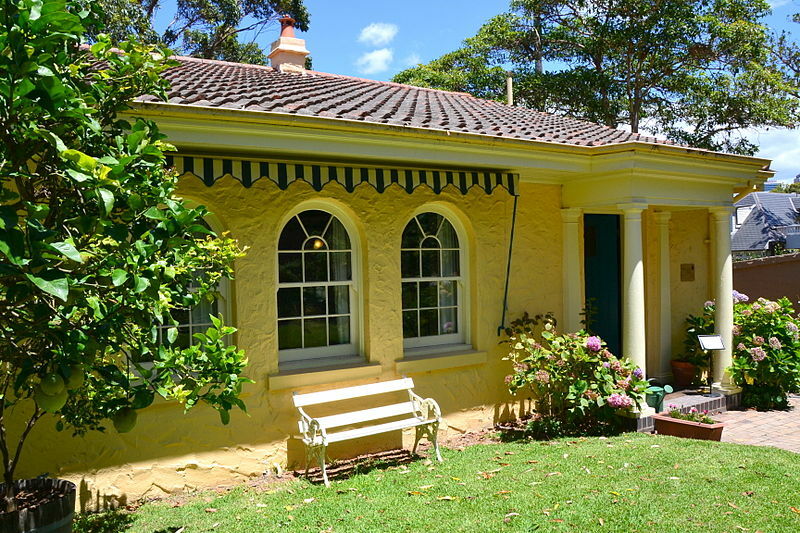 So Sydneysiders as we move towards celebrating 100 years of Snugglepot and Cuddlepie support the good work done by the volunteers at Nutcote and pay this lovely historic house a visit. There is a great collection of memorabilia you can also purchase. It’s bookmarks, coasters and linen tea towels for me. A girl can never have too many linen tea towels especially when they have the cute derrieres of gumnut babies on them. For those with a slightly warped political bent. Guess who these two are pretending to be Bib and Bub. I’d like to thank all at Nutcote for giving us such a special day and permitting me to take some photos without flash for this piece. It’s greatly appreciated. I’d like to thank Hardie Grant Publishers of ‘MORE THAN A FAIRY TALE, An Artistic Life’ by Robert Holden and Jane Brummitt for allowing me to use some photos from their book. Posted in Arts, Food, Politics, Sport, Kitchen, Reviews and tagged Beatrix Potter, Cuddlepie. Gumnut babies, May Gibbs, Nutcote, Snugglepot. Bookmark the permalink. Dear Gemmie, Thanks for the message of support. It’s greatly appreciated. I love the baby bunting. J. Wonderful article, Joan. 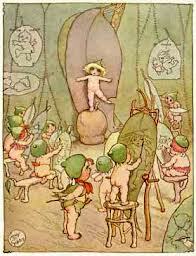 I love May Gibbs’ stories and drawings, and read them to my grandchildren. You have brought May Gibbs to life for me. What a beautiful home she had; I too must visit.